It’s really kind of interesting how these are coming out. Once I’ve got these started, they seem to take on a life of their own. I add things and change things, trying to resolve the basic artistic issues and I’m ending up with little houses that have personalities. This was not intentional. The personality just sort of evolved with the painting. While one of the earlier ones felt “brooding” to me, this one almost seems surprised. The house has a sort of “oh, my!” expression to it. Am I imagining this or is there something to it? And of course, while it’s still very cold outside, it’s nice to look at a flower garden – even one made up of bits of paper. 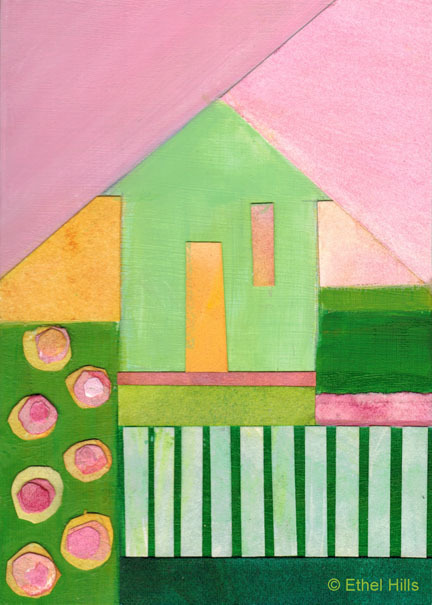 As I explore the house theme for my “Shelter’ series, I don’t seem to be on a linear path. The work keeps bouncing around from idea to idea, back and forth from funky to sophisticated. I’ve looked at this piece a lot and have finally decided to declare it done. Even though it’s very different from the other pieces that were started at the same time, I like it and appreciate its relative simplicity. 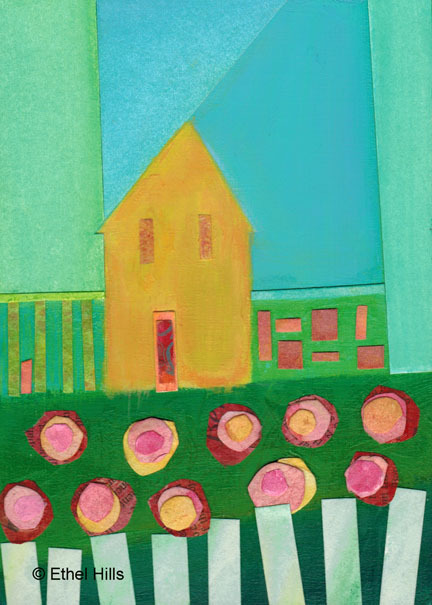 It has no collage added, but the interest is in the shapes and the subtleties of texture within the shapes. It’ll be interesting to see if there are more of these by the end of the series. Here’s the latest in my Shelter Series. This one was a bit of a struggle, but I’m pleased with the way it turned out. I wish that I had the foresight to take pictures of some of these paintings as they changed. This one has at least two complete paintings underneath the final version. This year has certainly been slow for painting. The first week of February and this is my first painting of 2014. This is one of several small “Shelter” paintings that I have in process. These have not been going together easily, at least so far. Although these are in some ways much more representational than most of my work, I’m still enjoying them. I’ve been playing with fairly simple patterns and have combined that with the somewhat 3-D effect of layers of paper collage. The painting I have for you this week is part of a new series that I’m working on. 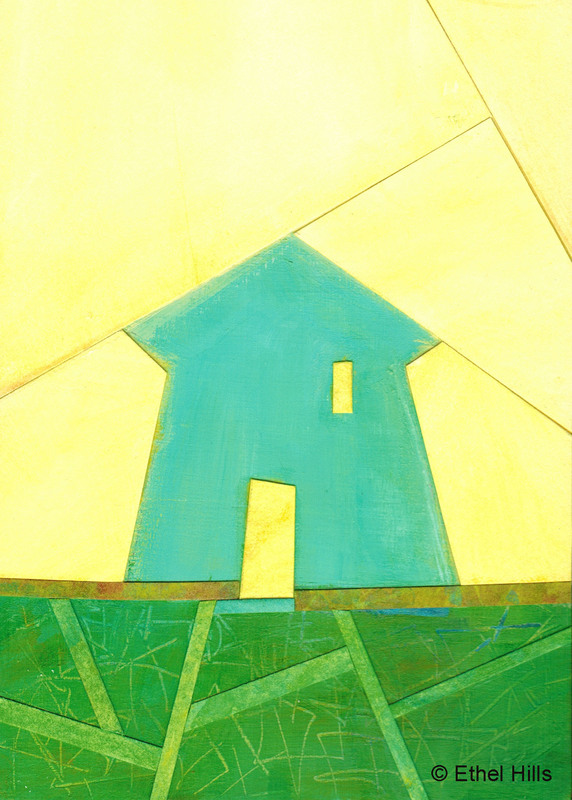 The working title for the series and so far for the paintings is “Shelter”. The idea starting in a kind of straightforward manner, but it’s blossoming into something kind of interesting. Initially, it had to do with a charity I support, the York County Shelter Program, Inc. in York, ME. Now, I’m realizing it may be as much about emotional shelter and refuge as it is about physical shelter. This is one of three paintings that I started almost 2 months ago. They’re all the same size – 7″ x 5″. 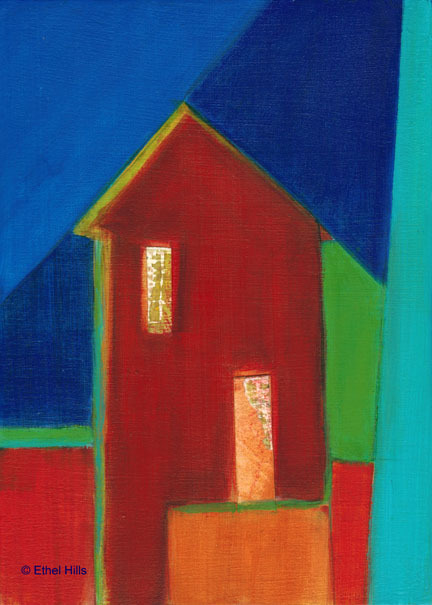 Initially, they were just stylized houses, painted in solid colors. The background was also divided up into different color and value shapes. Once I got the initial painting done, they didn’t seem to be working. In other words, they were boring. In the end, I added bits of collage to enliven the work. This piece has just a bit of collage. So maybe it’s not quite as flat and boring as it was before. I toyed with the idea of putting a moon in the night sky, but decided against it. The light and texture in the door and window seemed to be enough. What do you think? This is #75 of my 80 painting challenge. It looks like it’s going to be kind of close, but I think I’ll make it by the end of the year. More on that later. Saturday I dropped off my pieces for WCA-NH’s annual 6 x 6 exhibit. I got them done just in the nick of time, putting the last coat of varnish on the paintings Friday night. The exhibit will be going up sometime the first week of November at Studio 550 Art Center in Manchester. 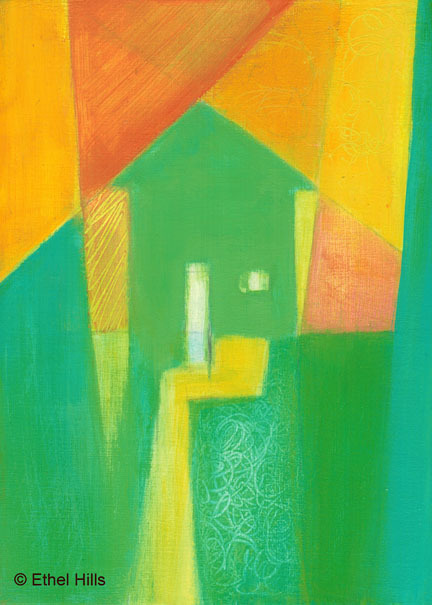 If you’ve been following this blog, you know that I spent most of September working on ideas for a series of paintings based on the idea of “Shelter”. These are the first paintings that I’ve done based on those studies. I’m pleased with the way they came out. I drew directly in pencil on the gessoed surface and then painted with acrylic. I primarily used liquid and fluid acrylics, which I think gives it more of the feel of the original watercolor studies. I’m pleased with these pieces and am quite excited to be starting on this new series. It will be interesting to see the reception of these, as they are quite different in some ways from my recent work. I have several different ideas for ways to explore this theme, so I think the final body of work is going to be interesting and diverse. After taking more than a month when I did mostly studies, It’s time for me to get back to my 80 painting challenge. These are respectively #53, 54, 55 & 56 in my 80 painting challenge.